Ah. Dubai. One of the worlds up and coming cities. Home to the world’s tallest building, the Burj Khalifa, and a bunch of other architectural wonders. It’s a pretty place, and an ultra-modern one too. The city, that is. 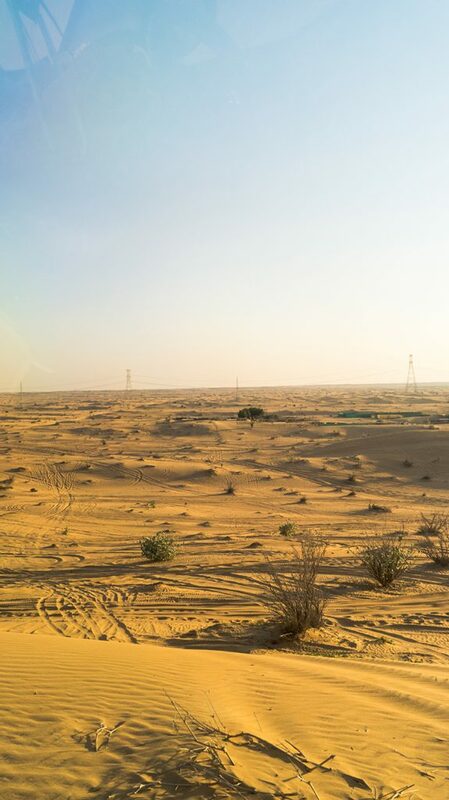 Have you ever wondered what lies beyond the Dubai’s outer suburbs, further into the desert? During my short lay over there, I set out to find out, and took a few pictures along the way.Lonelyplanet has a great resource to help you decide what to do when you get to Dubai, I’d certainly recommend taking a look at it. 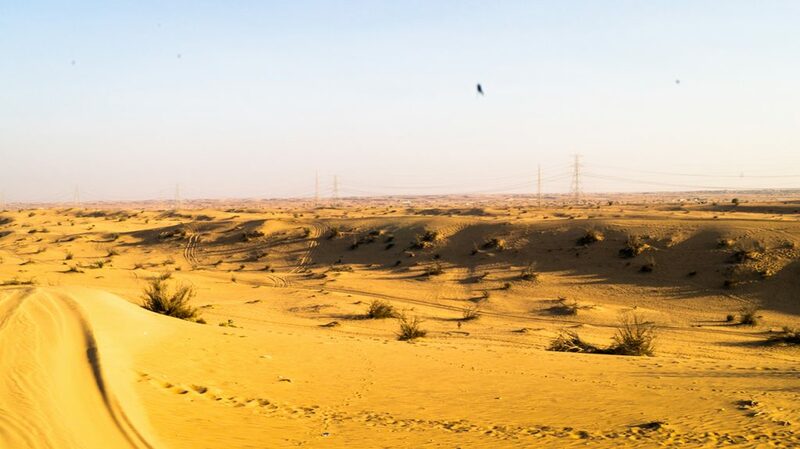 In fact, it helped me make the decision to head out into the desert on a safari trip, because of time constraints and all that fun stuff.Once I’d eventually navigated (read: managed to escape) the Dubai Mall, I finally found the pick up point for the safari. It only took me half an hour to find the exit, and even then I ended up walking out through the drive-in part of a car park and walking the long way around. #Genius. Well it worked, so it’s a totally legit exit.It’s at this point I met the other guys on the safari with me, as fate would have it, an Australian family from Sydney. Sometimes I swear the world is just teasing me. The extremely posh, brand new, air conditioned 4×4 made our short (20-30 minutes) drive out into the desert a pleasant and comfortable one. Just what I wanted after I’d been on the brink of running around the mall to get there on time (and I was still late).I’d just like to point out, driving a 4×4 over sand dunes is exactly as fun as it sounds. I’m sure that there’s a knack to it, I don’t have that knack. You should definitely try it though. 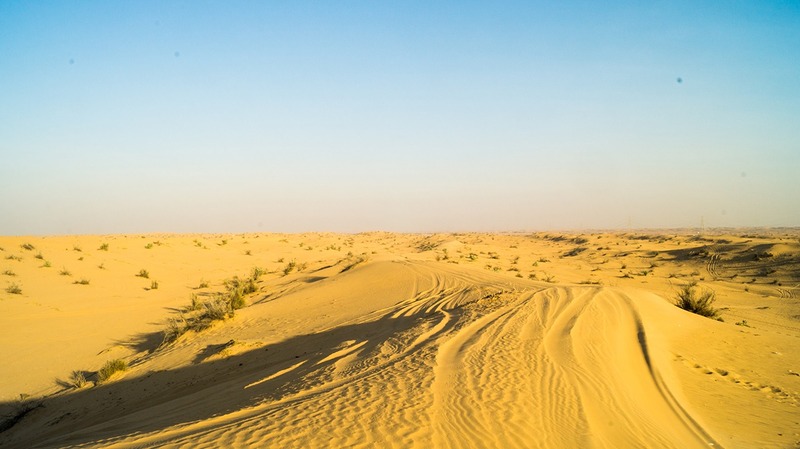 Almost sending the vehicle onto its roof several times makes for a pretty good adrenaline rush, and well, it’s helping you get deeper into the desert, and that’s exactly what you’ll want! If you head out in the mid-afternoon as I did, you can expect (at least in winter) a low sun bearing down on the desert. It makes for some pretty intense views of the dunes and the random shrubs that seem to be cropping up everywhere. Don’t get me wrong, I’ve seen golden sand before, but this is something else. You’ll also see what seems to be a never ending power line. I guess their electricity needs to cross the desert one way or another, and if you’ve ever tried digging a hole at the beach you’ll understand what I mean when I say sand likes to fill itself back in. If you take out the glare, it does get a bit more shady. But it’s still an amazing view. You’ll also notice all of the 4×4 tracks that seem to go wherever they like. I could be wrong, but I don’t think there are any road rules for off-roading through the desert, other than your general stick to the right side (why must everywhere be backwards compared to England).Once we got to camp (which I’ll cover in the second part of my Dubai posts) we were welcomed by some lovely little camels. By lovely I mean evil and by little I mean not little. That’s camels for you. Apparently they don’t work very hard, because I only ever seemed to see them lazing around doing nothing. They look pretty chilled out to me, especially considering they’re essentially wearing winter clothes in the heat. Granted there was a fair bit of shade when I took this picture, you get the idea!The camels were tethered together in groups of 3, although you’d never guess with this guy just in the middle of nowhere, off by himself. At least hes a poser. 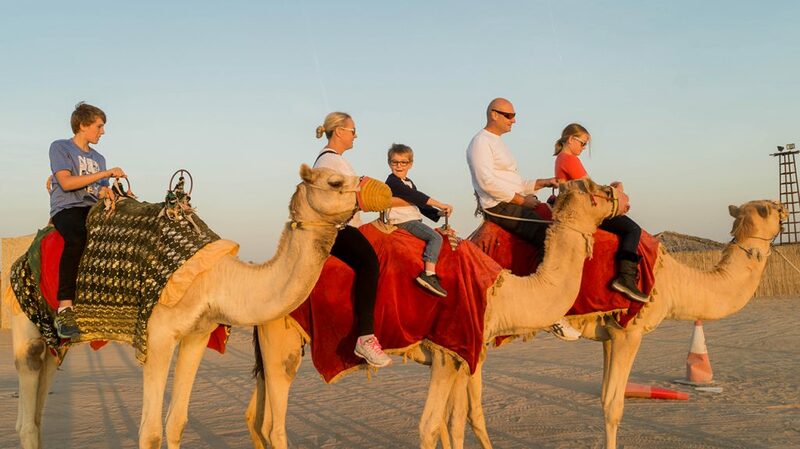 Then we got round to the fun parts; camel rides!Why is it, no matter how many times you ride a camel, you never remember how rough it is as they get up and down and nearly throw you off? Until it happens, and then you remember it vividly. Luckily this time, I’d been prepared and managed to grab a few shots of people almost falling off, sadly, I’d not been prepared enough to change my camera settings to actually make use of said pictures. 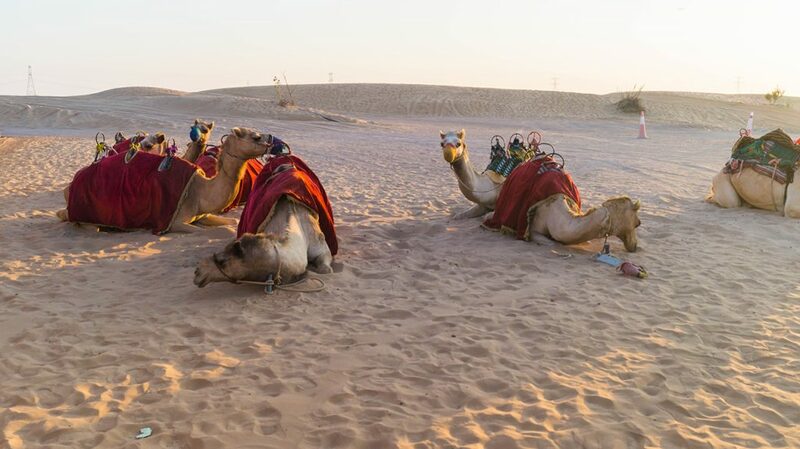 Yay.Just because I can, here’s a picture that DID come out alright, of the other guys that I went on safari with riding the camels together. In total honesty it was a great laugh just driving around the desert and riding camels for the afternoon, and it meant getting out of the city and venturing a bit further out of Dubai. If you’re ever visiting the place, I’d certainly recommend looking into it. The safaris are quite cheap, and in my opinion, really good value for money. They’re particularly good for filling up time during a long layover in Dubai, as I did, and if you check beforehand, depending on your passport, you might even qualify for a free visitor visa on landing which will allow you to go out and explore rather than spending what seems like forever in the airport.Even better than all of this, is that Dubai has been built in such a way that you can easily grab yourself a ticket and head directly from the airport to more or less anywhere in the city via the metro. And unlike in the UK, they’re actually reasonably priced and on time. And even translated into English. No excuses.Just curious for next time, have you been anywhere “different” in Dubai or the UAE? Let me know what and how it went, I’m still finding things to put onto my next itinerary!In case you missed it, here’s the cover photo in full. I much preferred the 4×4 experience to sitting on top of a camel. 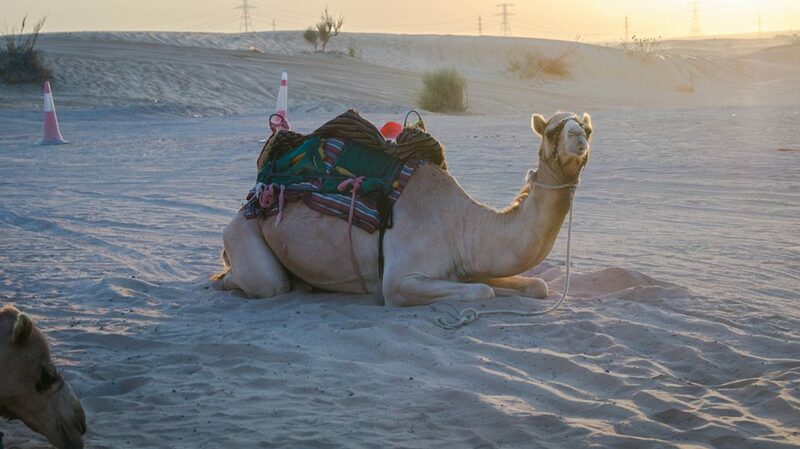 I loved bursting over the dunes in a Landcruiser but found the camel’s saddle incredibly uncomfortable.